Jharkhand, a BJP ruled state in India is acting and behaving against Minority community especially against the particular Muslim community. C both the places at the centre and at the State level (Jharkhand) BJP is ruling Party. AS a political parties BJP rules the State, but her ancillary organisation, like VHP, ABVP, Bajrang Dal,Vanvasi Kalyan Ashram,and Gau(cow) Raksha committee are creating hatred against the Muslim community.Last year in September,2015 Akhlaq Ahmad a Black Smith of Dadri was lynched by Hindu mob alleging that Akhlaq had Beef in his Refrigerator. It was a false propaganda against Akhlaq. Forensic Lab Test proved that it was not Beef but a Mutton. What is going on this country? Where is Democracy and Secularism in India? Democracy ,Secularism and Co-existence/ composite culture is the Core value of the Nation. Every body has right to express their opinion without any hesitation. Is India approaching towards Hindu Raj. Hidu Raj means to re=established Brahmanical Social Order (BSO). Dr. BR Ambedkar has rightly opined that If the Hindu Raj becomes truth, it will be a National Calamity. If we go through the Media Reports we see from UP, Haryana, J&K and other state many Cattle traders either were they arrested or beaten brutally or killed/hanged. 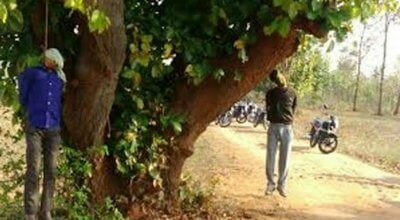 In Jharkhand Balumath block of Latehar Dist two Muslim Cattle traders were brutally killed and hanged in a tree. This happened around Holi (Hindu festival) period on 18th march,2016. After protest from people and Villagers Police filed an FIR against accused. Five accused were arrested with in a week. Two weeks back JD(U) MP (Rajya Sabha) Md. Gulam Rasul Baliyali visited the spot to find out the situation. Talking to media he said BJP ruled Jharkhand Govt. is anti-Muslim and anti-Minority. Innocent Muslim is being murdered. Last week He raised this issue in the Rajya Sabha. This brutal killing of Muslim issue went to National Commission of Minotity (NCM). NCM made an enquiry and found that there is unholy nexus between police and Hindu Communal Organisation. 5 th October,2014. In Chaibasa few cattle traders were caught by the villagers,hence there ceated tension between traders and villagers. 25 th January,2015. In Bagbeda VHP caught 26 cattle from cattle thief, all fled away. 15 th February,2016. In Garhwa Dist. Villagers caught 9 cattle from cattle thief and handed over to the Police. 18 th Feb,2016. In Garhwa Dist Villagers recovered 50 Cattle from traders and handed over to the Police. 2 nd July,2015. In Shahpur (Palamu Distt) Villagers c aptured cattle loaded truck and handed over to the Police. 8 th Sept,2015. In Garhwa Dist. Near Ramna Rly Station villagers caught 75 cattle and handed over to the Police. In 2015 Near Khel Gaon Ranchi Few people caught cattle loaded truck and handed over to the Police. October,2015. In Chaibasa bari Bazar one guy with cattle meat was found in a Bus , he was beaten up. 4 th March 2016. Hindu Jagran Manch caught cattle traders in Gaghra block of Gumla Distt, but the supporters of Hindu Jagran Manch were beaten by cattle thief. Case was filed by cattle traders and all cattle were recovered. 5 th March,2016. Two trucks loaded with 65 cattle were recovered and two were arrested. 14 th March,2016.Police recovered cattle loaded 5 truck and arrested 11 persons.